In this work the bodhisattva Avalokitesvara is represented in the guise of his female avatarQuan Am (Guanyin), a form extremely popular in neighboring China, and the object of particular devotion in the north of Vietnam where the figure comes from. The bodhisattva is recognizable by her costume, a full robe knotted at the waist, a cloak covering her shoulders, and a veil on her head. The lavish ornamentation -foliation in the hair, and pearl necklaces- is also a legacy from Chinese tradition. The deity is sitting, one leg folded, on a rugged rock. The folds of the material, the details of the ornamentation, the plenitude of forms, and the extremely majestic sense of elegance are hallmarks of the crowning period of Buddhist art in the 17th century in the Hanoi region. This is an outstanding piece by the sheer quality of workmanship. 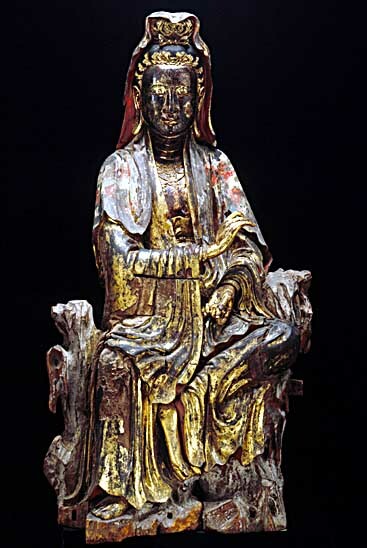 In addition, the image is accompanied by a Chinese inscription -rare in this type of sculpture- which reads: “the holy and virtuous Quan Am in the white robe”. The work was originally polychrome, and thick coats of gilded lacquer were applied at a later date. Quan Am was venerated in Vietnam, where she was also regarded as a “purveyor of children”. The iconography derives from a scholarly tradition originating in China during the Northern Sung dynasty (960-1126) and thus features a humanized bodhisattva whose appearance is in stark contrast to the Tantric models of the Tang period (618-907). This work probably stood in a major shrine, housed in one of the lateral areas of the entrance to the temple.